Fashion is a statement. Kasia`s products are a statement – your statement. Be brave and be who you are or want to be. Be or KNOT to be. Kasia designs and crafts statement fashion, especially necklaces and earrings. Based in Dublin, originally from Poland, she creates beautiful colourful eye-catcher. The necklaces are made of recycled fabrics and the packaging is fully recyclable now. Creative, charming and authentic – I had the chance to meet her in her exclusive pop-up shop in the Fumbally Exchange, Dublin. Who is the businesswoman behind beorKNOTtobe? Where does her creativity come from? How is it to be in the craft business? How can you love your job? What makes her products special? How does she organize marketing and advertising? What are her goals? What happened since? New designs, new product lines, new studio. Kasia moved into her new studio where she has a place for meditating and creating. It is quirky, colourful but also natural and elegant as her products are. The colour of her summer products was mustard and a mix of pastel shades of rose, blue, green and more. 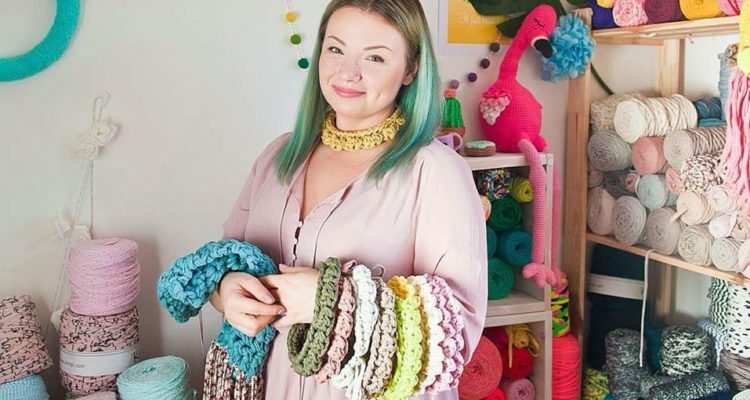 She created new designs, like the Chunky Statement necklaces or the Pompom Hoops earrings. Some of her products have a new gold magnetic clasp. Kasia achieved her goal of getting more and more sustainable – her packaging is fully recyclable now. Besides that, she supports monthly other makers and she has been part of the fashion meeting “Targi Mody” in Poland. She opened her pop-up store in one of the three “Fumbally Exchange” hubs for one week in April 2018. Fumbally Exchange (FEx) is a design and innovation community with a focus on small businesses, sole traders and start-ups. The latest event was on Dublin Culture Night a week ago. Members of the community prepared the space for all visitors to experience unique creative activities. The most impressive seemed to have been the huge portrait window: Portraits of passers have been drawn on the shop window by the passers-by. Pictures in the Slide-Show: Kasia herself, Malgorzata Chudy. Stay up-to-date via Instagram, Facebook, and Etsy.